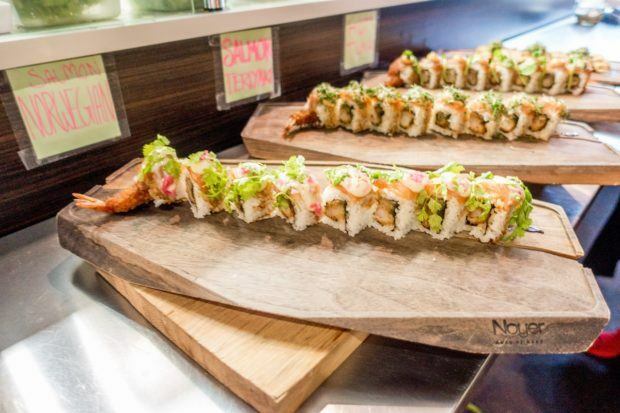 It’s almost impossible to be unhappy when you’re surrounded by food. The amazing smells, the bright colors, the sound of meat sizzling on the grill and wine glasses clinking in a toast to the weekend. 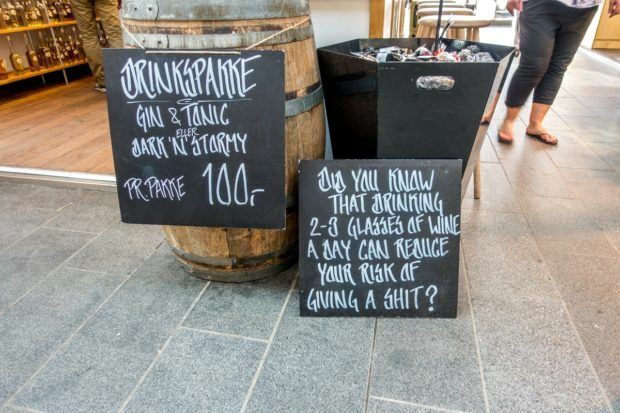 It’s the scene we encountered at each one of the Copenhagen food markets we visited. Full of good food and good fun, here’s a look at the three markets that ensured we were in foodie heaven. 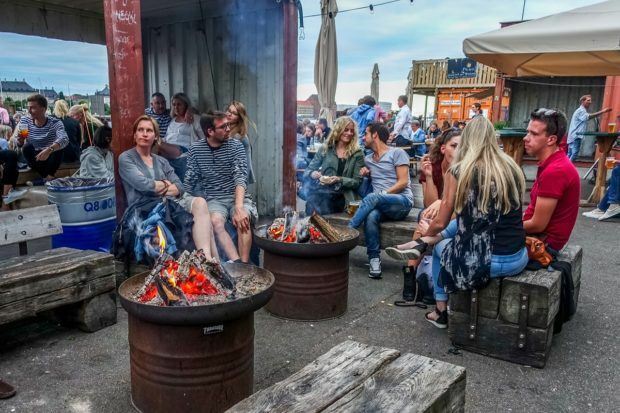 In Copenhagen’s Meatpacking District, the Kodbyens Mad & Marked (Vesterboro) hosts up to 70 food stalls on weekends throughout the summer. 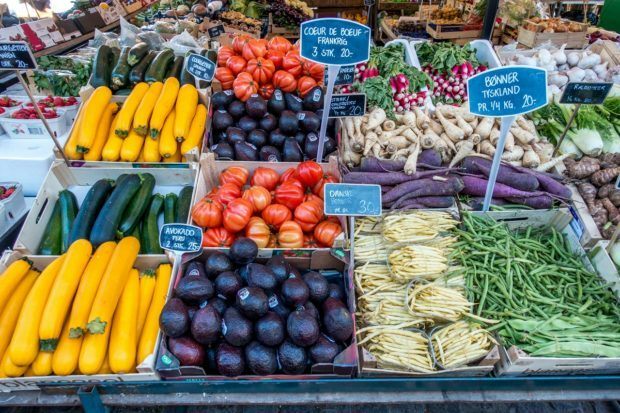 Market organizers aim for diversity and moderate prices, so if you have the great fortune to visit more than once, you’re likely to encounter a different group of vendors. Some came in actual food trucks, setting up shop in the giant parking lot, while others had regular stands, cooking their hearts out under tents and tarps. On our visit to the food market, we saw everything from gyros to tacos to specialty sandwiches from Italy. And that doesn’t count the broad selection of cocktails, beer, specialty juices, and more. It was nearly impossible to choose among all the fabulous offerings. Each Sunday at Kodbyens Mad & Marked has a different theme. It may be a country, a type of food, or even a holiday. It was our luck that the theme during our visit was wine. And when it comes to themes, the market organizers don’t mess around—they specially curate the participants to give visitors a great experience. 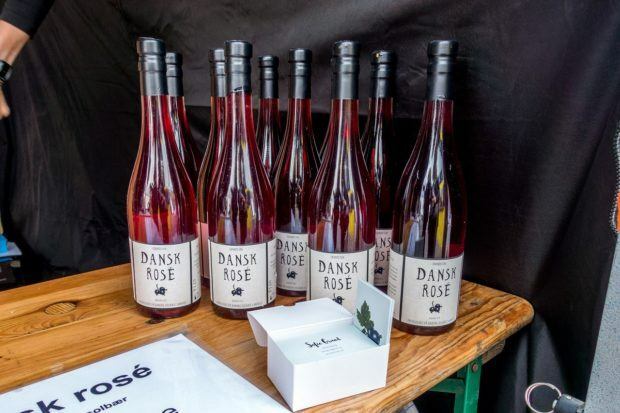 There were familiar varietals from Italy and France, but some of the vendors featured local Danish wine alongside selections from Macedonian producers like Popova Kula and other lesser known wineries across Europe. From the wine vendors to the food truck cooks, everyone seemed to be having a great time sharing the love of their products with customers, and that kind of happiness and passion is always infectious. See the other fun places we visited during our four days in Copenhagen. In terms of setting, Torvehallerne is nearly the exact opposite of Kodbyens Mad & Marked, but there is just as much energy buzzing through the place. 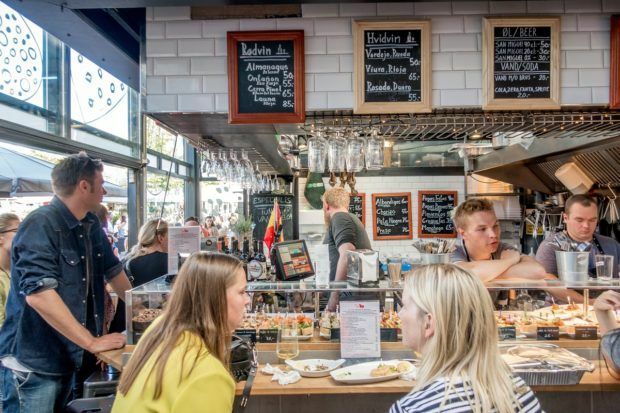 Near the busy Norreport Station, the two steel-and-glass buildings that make up this Copenhagen food market are home to over 70 food stands selling everything from fresh fish and produce to gourmet chocolate and specialty salts. The outside area between the buildings has additional fruit and vegetable vendors. The variety is incredible, and the organization is cleanly Scandinavian. Everywhere there are bright colors and beautiful display cases. 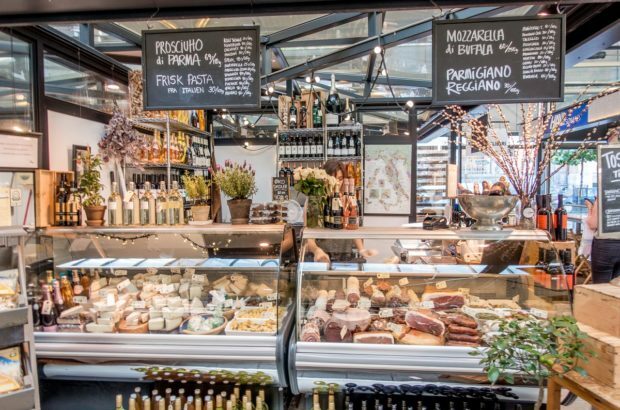 Torvehallerne is the perfect place to do your grocery shopping, snap up a foodie souvenir, or stop for a bite to eat. There are the typical Danish open-faced sandwiches, but you can also get tuna tempura, a specialty Spanish jamon and cheese plate, or fresh oysters with white wine. We opted for some tapas and cava because why not have a little Barcelona in Copenhagen? Copenhagen Street Food feels like a combination of the other two food markets—it has the indoor setting of Torvehallerne but the funky style of Kodbyens Mad & Marked. 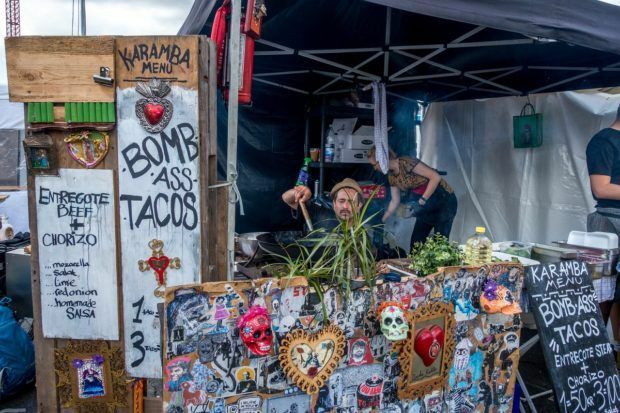 Just a few steps from Christiania and across the harbor from colorful Nyhaven, the 30+ food stalls and trucks of Copenhagen Street Food offer a stunning array of options from tacos to Indian specialties and Korean food…and everything in between. Even better—each stall is required to offer one dish for DKK 50-75 (USD $7-11), which is a true bargain in pricey Copenhagen. 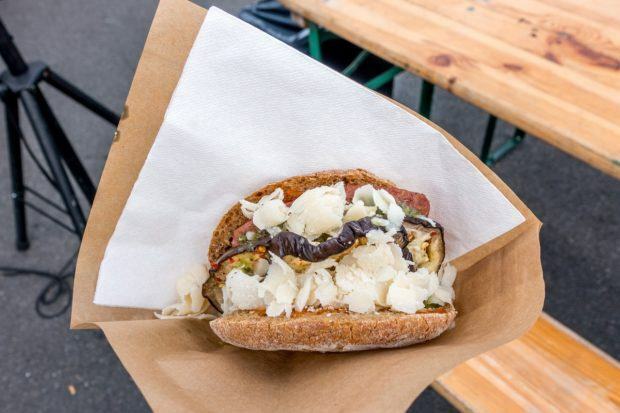 Everything about Copenhagen Street Food is cool. 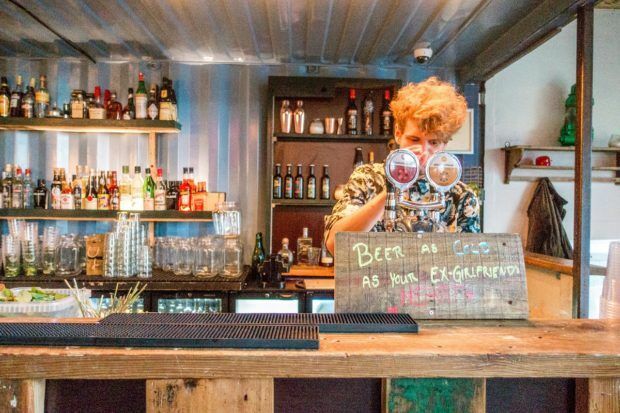 Inside, the choices for food and drinks (including every type of beer and giant mojito you can imagine) are extensive, and visitors lounge around the indoor fireplaces or stake out spaces at communal tables. Kodbyens Mad & Marked: From April to September, the market is open 10:00-6:00 every Saturday and Sunday. The market is in the parking lot at Flæsketorvet. Torvehallerne: The market is open daily at Frederiksborggade 21. Hours are 10:00-7:00 Monday-Thursday, 10:00-8:00 on Friday, 10:00-6:00 on Saturday, and 11:00-5:00 on Sunday. 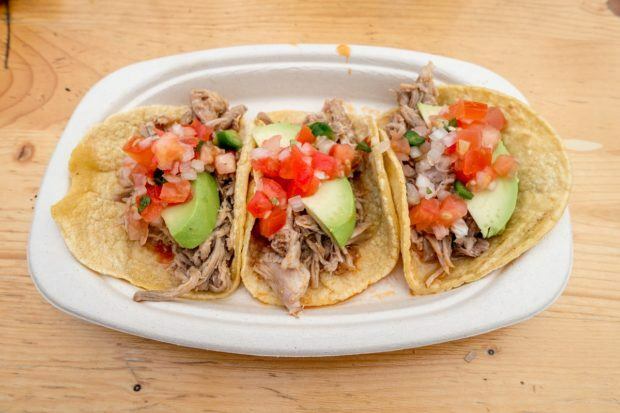 Copenhagen Street Food: The market is open daily from 11:00am until 10:00pm. It is located at A, Refshalevej 167. What do you think about Finding Foodie Heaven at Copenhagen Food Markets? A new one has just opened up, Westmarket, on Vesterbrogade, close to Enghavevej. Not as good as the others (yet, at least) but well worth a visit. 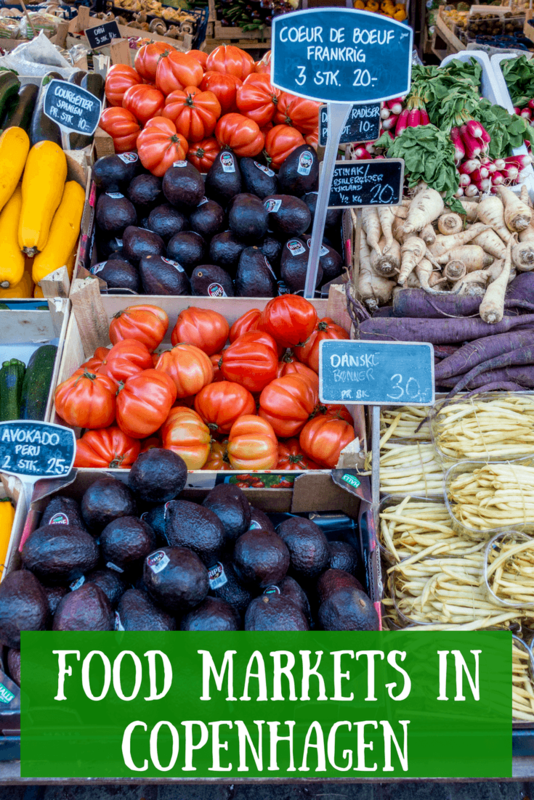 My favourite place to check in when I travel is a local market its a great way to find out more about the culture, the community and the food can be just heavenly I have a series on my blog about farmer’s markets and the like and just can’t resist an article like this. Love it!! I’m a huge fan of Copenhagen and it is back on the list for 2018 travels. I’ll have to check some (read: all?) of these out.